When you have safety in mind, you might want to consider driving a vehicle that has a backup camera. This is a camera that activates when you put your car in reverse. The camera gives you a view of what is behind you, showing you the camera image right on your dashboard. A backup camera is easy to use, and provides you with an extra layer of protection when you are backing up your vehicle. At our dealership, we offer a number of vehicles that come with this added safety feature and are happy to show you your options. 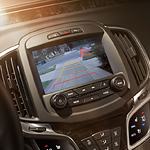 Keep you and your family safe by driving a vehicle that has the important safety feature of a backup camera. You will be able to see behind you clearly without craning your neck. You will have a much better view than if you try to turn your head instead, giving you added safety.